Over the last few months one has been seeing the revival of lost recipes and food festivals featuring ancient Indian cuisines in some of the finest hotels of the NCR. This may be called a current trend, one that we hope will continue until the dishes of our rich culinary past come to the fore once again. But, there is one restaurant that has been using an ancient technique of slow cooking called dum, consistently for the last 25 years. Dum Pukht at the ITC Maurya has been famous for serving the softest kakori kebabs and immensely aromatic biryanis to many heads of state, global icons and celebrities besides their regular guests. The celebrations that are on this week include a ceremonial unveiling of the Grand Dum Pukht Biryani at 9pm everyday. 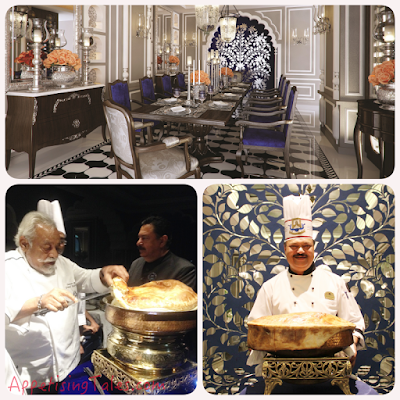 The evening that I am there, Grand Master Chef Imtiaz Qureshi, the one who introduced this cuisine at Dum Pukht, carves the purdah biryani amidst much fanfare with bagpipers marching through the restaurant. Then there's a draw of lots, from which one of the tables is chosen as Mehmaan-e-Khaas, which means that their dinner is complimentary. Bottom Left: Chef Imtiaz Qureshi; Bottom Right: Chef Ghulam Qureshi. As we are served one delectable dish after another, we are enthralled with stories by Chef Imtiaz as well as his son in law and the current Chef De Cuisine, Master Chef Ghulam M. Qureshi. Over discussions of how dum cooking developed in Lucknow to the explanation of qorma, qaliya and salan comes our first course. 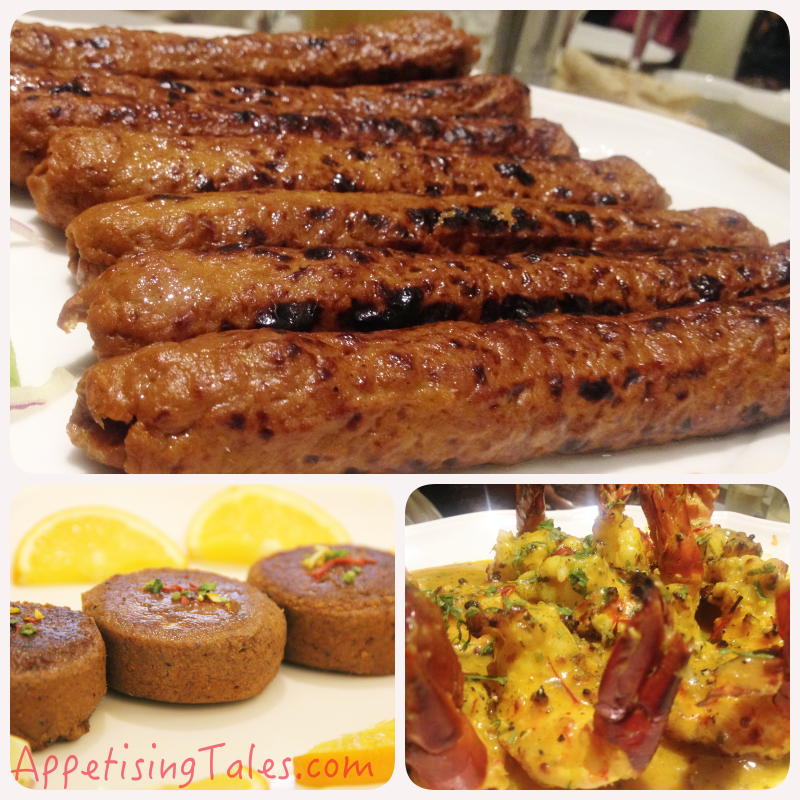 The silky smooth Kakori Kebabs simply melt in the mouth. The Sheekhampoor Kebabs are flavoured with spices and orange zest from the special Nagpur narangis and served with a navrattan chutney. But what surprise and blow me away are the Jhinga Dum Sunheri. These tiger prawns come doused in a luscious golden gravy with a liberal sprinkling of saffron, and are fantastic. Bottom Right: Jhinga Dum Sunheri. Chef Ghulam shares that the trick of this cuisine lies in the precision it requires right from the beginning. “Since dum cooking involves tightly sealing a round, heavy-bottomed pot, or handi, with dough over a long period of time, one cannot adjust the spices and seasoning at the end of the process,” he says. The sealing of the handi allows the rich flavours of the herbs and spices to release, and the food is cooked slowly in its own juices. This creates an inimitable aroma once the seal is opened. 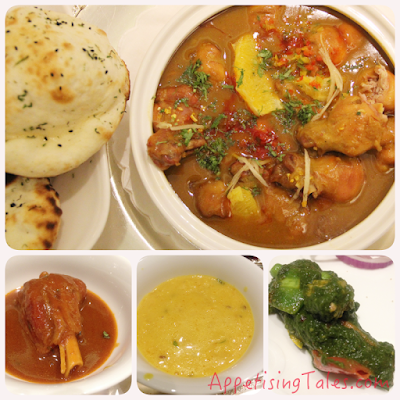 Thus follow the succulent Nalli Gosht and the Murgh Narangi Korma. What I appreciate is that there is absolutely no ghee/oil floating on the curries. The richness of the dishes comes from the clean cuts of the meats used and just enough fat that the dish requires. Amongst the vegetarian options there’s a Guchhi Korma, Dal Dum Pukht and a delicious mélange of seasonal vegetables cooked in a smooth green puree of spinach and fenugreek called Subz Miloni. I do like some greens on my plate when I’m having lots of meat, and this is a fantastic way to do that. Another balancing factor is the Awadhi Kulcha that has just the right amount of khameer in it that makes it delicious as well as healthy. Then comes the Dum Pukht Biryani. I opt for the mutton biryani. Unfortunately I cannot describe the beautiful aroma that wafts out when the atta seal is opened. But it is divine. Chef Imtiaz shares that the meat and rice are cooked separately before being layered and sealed in the handi. Laung, elaichi and dalchini that are used while cooking the mutton are washed and strained until only their rich essence is left, while javitri, jaiphal, ittar and kewra are used to flavour the rice. The accompaniments include a Mirch Baingan ka Salan and a garlic infused raita. 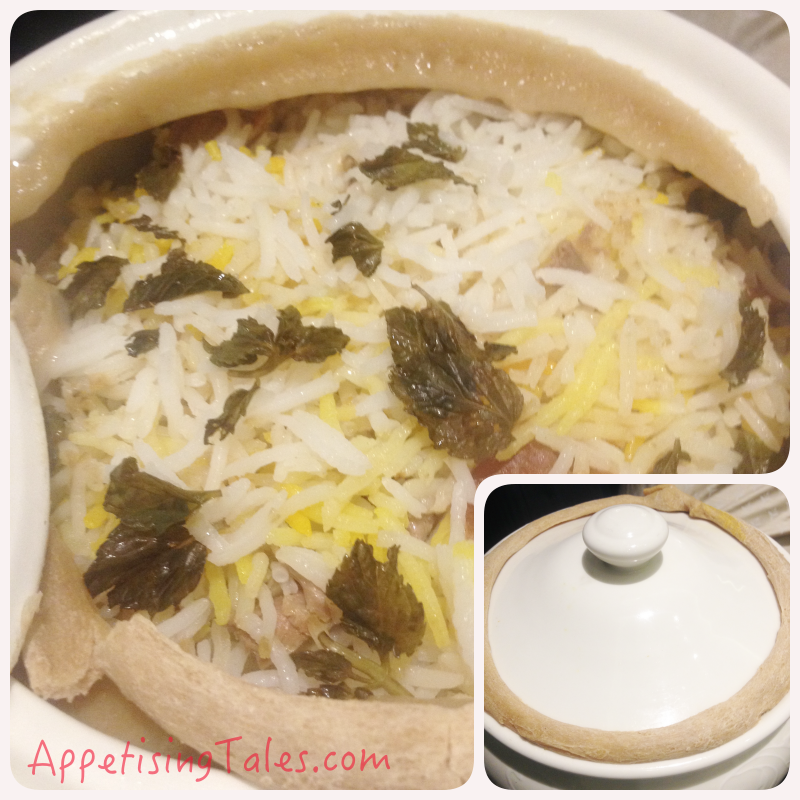 For me, biryani doesn't get any better than this. The Meetha includes a mildly sweet Malai Gilori and Taar Halwa. But the dessert that I really like and am thrilled to carry home with me is a beautiful handi of Seviyon ka Muzzafar. The dry seviyan have been cooked with khoya and topped with almond slivers and silver sheet. 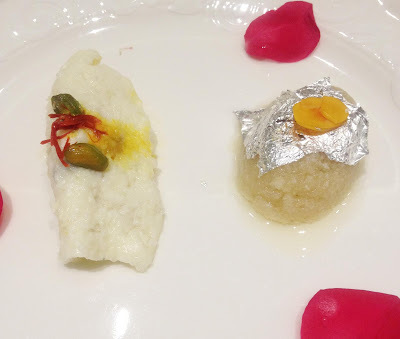 Desserts: Malai Gilori and Taar Halwa. Dum Pukht, ITC Maurya, Sardar Patel Marg, Diplomatic Enclave, New Delhi-110021. Timings: Dinner only 7pm -11.45pm. Prices: Master Chef Ghulam Qureshi’s ‘Shahi Dawat’ menu featuring delicacies crafted exclusively for the occasion at Rs 6,000 per head available till 11th October. A la carte also available.